If you’re looking for a cabled sweater for autumn that will look as good with a smart skirt as with jeans, take a look at Sarah Hatton’s sophisticated design. The neat arrangement of cables and twisted stitches produces a lovely fabric; a scooped neckline adds to the feminine look. 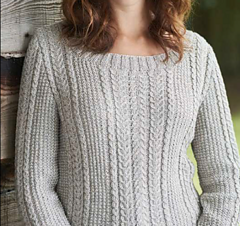 The sweater is knitted in Rowan’s Softyak DK, which has a lovely softness and handle thanks to the blend of cotton, yak fibre and nylon. It’s machine-washable and available in 14 glowing shades. 24 sts and 32 rows to 10cm over rice st st on 4mm needles. Centre cable panel measures 13cm on 4mm needles. Narrow cable panel measures 6.5cm on 4mm needles.